For additional information about this book, visit the website www.ellencastro.com. In today’s stressful, non-traditional and intense times, competence alone has ceased to be enough to succeed in business or in life. Emotional intelligence (EI) and leadership skills are required. 75% of Fortune 500 companies use EI testing. EI accounts for up to 69% of job performance. EI is almost 90% of what differentiates a star leader from the mediocre. A recent study concluded that only 11% of employees failed because they lacked the technical competence to do the job. 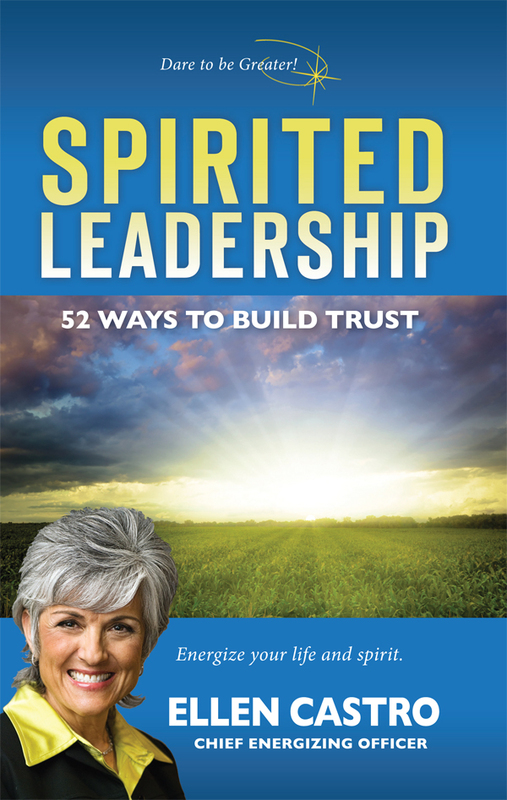 Spirited Leadership: 52 Ways to Build Trust equips readers for success regardless of external forces. Harness your personal power with this concise leadership workout and resource. Gain the competitive edge given the new reality that people smarts matter regardless of title, position or field. This pragmatic, relevant and action oriented personal power leadership toolkit and resource uplifts, empowers and strengthens readers of all ages with “how-to” exercises for liberating, igniting and amplifying greatness in them and in others. Team leads, supervisors and managers will use the workout to coach, manage and lead others, and as a weekly teambuilding activity super-charging trust, motivation and engagement that attracts star performers. Harried time-challenged influencers and professionals wanting better, quicker and enhanced results will gain insights and solutions for honing their leadership skills thus increasing EI, people smarts and success. Individuals entering the workplace will find it invaluable in assimilating into the workplace with essential communication tools, social skills and people savvy. Christians and faith-based individuals desiring to reflect His glory at work and in life will find Spirited Leadership an uplifting and joy-filled guide for building their career toolbox, living a life of authenticity, excellence and meaningful success. Entrepreneurs who want to build a brand value of credibility and service will find this a valuable blueprint. 100% of the author’s business - 20+ years - is through referral and repeat business. People searching for happiness and a sense of significance during these stressful, roller coaster times of ups and downs, twists and turns will find both within with this essential workbook and guide. Regardless of title or position, every reader can use it as an immediate reference for turning breakdowns into breakthroughs – shutdowns into turnarounds. Executives and those desiring to be executives will gain insights into strengthening their reputation and for building leadership bench strength for today’s challenges and tomorrow's opportunities, while having more meaningful success. The unemployed will find this a positive, constructive resource to re-tool and re-build their confidence. Spirited Leadership is a perfect primer for high school and college students who want and need a heartfelt yet practical guide for their personal and leadership development. Associations such as Project Management Institute (PMI) and non-profits such as the Komen Foundation can use this toolkit to uplift and educate their targeted audiences. Mentors and coaches will find it useful in facilitating deep conversations for their protégé’s growth and success. Harness your personal power. Live energized regardless of external forces. Dare to be greater with Spirited Leadership: 52 Ways to Build Trust.